What I like to add is there are general strategies that can help you use even less bandwidth. You can apply them to regardless of the device (Windows, iOS, Android) you are using. Do keep in mind that by using one or few of these tips you might reduce and/or restrict certain functionalities. The goal here is to limit our device from accessing the Internet unless we really have to. Nowadays, images taken from your phone are in high resolution. If you are emailing it or uploading to your blog/facebook, consider resizing it down to 800 to 1000 pixels wide. You can get really good quality for less than 200 kb. use a program that auto shrink images for you. For example: Shrink Pic for PC works quite well. It automatically resize images when you upload to Gmail. if it is a photo, try saving it as JPEG format and see if you can adjust the compression level to reduce the file size and at the same time maintain a good quality. If you already sent an email with attachments and you want to send the same attachments to another recipient, if you are using an online email service like Hotmail or Gmail, you can use the forward option to send the attachment without having to upload all the files (and take up bandwidth) again. With forward function, you can even change the email text and title. Try compressing the files before sending. 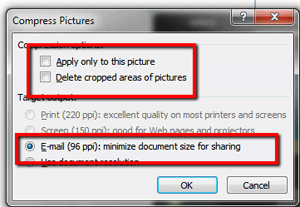 If your file has a lot of pictures, consider compressing the images in the document before sending. In Word or PowerPoint (I am using Office 2010), highlight an image and click on Compress Pictures under Picture Tools Format menu. Uncheck Apply only to this picture so that it will compress all the pictures in the document. Select E-mail (96 ppi). This will compress the images for email. Use this if your recipient doesn’t need to print the document or project it. a PDF takes up more space than a Word doc. If you are going to use a PDF, consider compressing it in a ZIP file before sending. Removing video and use audio only will help reduce bandwidth during a chat with your friends. When you type in the chat box, for each character you type it uses up data (data is used to indicator to the other party that you are typing). Consider typing in a notepad then cut and paste the whole sentence or paragraph to send it in one shot. Disable wifi when you are not using the Internet. For emails and blogging, type it in a Word doc offline and then go online and cut and paste. Uninstall and remove programs, apps and start up programs which you do not use. Turn off programs when you are not using. For example, if Evernote is displayed on your Notification Area in Windows, it is running in the background and will conitnue to sync your data. Dropbox works the same way.